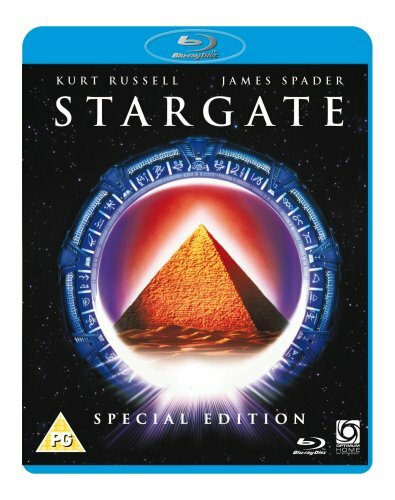 A self-consciously epic sci-fi adventure of Cecil B DeMille-sized proportions, Stargate refreshes and combines several well-worn sci-fi and sword 'n' sandal genre conventions with some Erich von Daniken-style Biblical Egyptology. The directing-writing-producing team of Roland Emmerich and Dean Devlin had previously collaborated on B-movies Moon 44 (1990) and Universal Soldier (1992), but handed a significantly bigger budget they were able to give their Steven Spielberg pretensions free reign here ("Indiana Jones and his Close Encounters with the Chariots of the Gods" might be a suitable subtitle). James Spader is endearingly dithery as the fish-out-of-water academic who finds himself teamed with taciturn tough guy Kurt Russell: the two excellent leads are largely responsible for imparting what depth there is to otherwise two-dimensional characters. British composer David Arnold makes his major studio debut in the grandest fashion with an outstanding score that pays suitable homage to epic film music (John Williams' CE3K and Maurice Jarre's Lawrence of Arabia in particular). It's all done with such unabashed enthusiasm that viewers will happily forgive the film's derivative elements and even overlook the high-camp theatricality of Jaye Davidson's bizarre bad guy. Despite subsequent huge box-office hits (Independence Day, Godzilla, The Patriot), Stargate remains Emmerich and Devlin's freshest, most satisfying film.